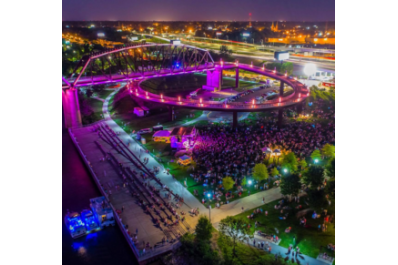 The WFPK Waterfront Wednesday Concert Series is a monthly free concert on the Big Four Lawn in Louisville Waterfront Park, adjacent to the iconic Big Four® Pedestrian/Bicycle Bridge. The kids activity area is led by Jecorey Arthur, 90.5 WUOL’s Music Education Manager. The 90.5 WUOL Classical Corner will offer activities where children can play, explore, and learn the world of classical music. It’s free and open to all ages when you sign up at our information booth or have a Cultural Pass. All children must be accompanied by an adult. Activities begin when the lawn opens at 5pm. Outside alcohol is prohibited. No coolers, no glass or pets allowed in the event area of the Big Four Lawn and the adjacent park areas. A free trolley service, courtesy of Republic Bank, will be offered between Witherspoon and the Big Four Lawn for people who park West of I-65. The Republic Bank Easy Trolley will run a continuous loop between 6:00 p.m. until 10:30 p.m. We strongly suggest parking West of I -65 in the Witherspoon, Humana, and surface lots. 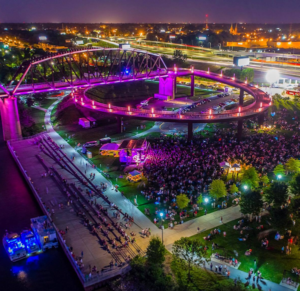 The Waterfront Development Corporation (WDC) and WFPK first partnered in 2002 to produce an innovative concert series that showcased local and emerging national recording artists as heard on radio station 91.9 WFPK FM. Each free concert attracts large audiences to mingle, dance and enjoy the river in a family-friendly park atmosphere with a cash bar and upscale festival fare including: Rack House BBQ (bourbon inspired/fusion BBQ) including Beef Brisket Kimchi Tacos, Jerk Pork Sliders, Bourbon Barrel Smoked Chicken on a cornmeal dusted Kaiser roll as well as the traditional southern BBQ offerings, slaw, potato salad, pulled pork, rib tips, The Big Four® Taco Stand featuring beef, pork & chicken tacos and quesadillas, The Burger Joint – Traditional All American Burger Joint. Burgers dressed to order, an “Original State Fair Corn Dog” stand, and the Mediterranean Cuisine Stand featuring beef, chicken, and fresh vegetables stuffed into pita, salads, grilled portobello mushroom sandwiches. WFPK Waterfront Wednesday is presented by 91.9 WFPK and the Waterfront Development Corporation with support for our sponsors.